Given his incredible stature within the game, every time adidas release a new Messi boot it has fallen right under the spotlight. This latest tech advanced release, the Messi16+ PUREAGILITY, marks Adidas’ first official move into the ‘agility’ fray and is also the first boot in the Messi range to feature a TechFit collar. As a result, this is a very different type of boot that has a lot going on. Released prior to the kick-off of Copa Centenario, we’ve spent plenty of time with them trying to figure out exactly what they have to offer the market. The results below should fill you in on exactly why this is a boot that suits arguably the best player in the world to a tee! Find the Messi16+ PUREAGILITY line-up at soccer.com. Given that this boot is built around the game of one player, Lionel Messi, it is unsurprising to see it take on a new category type. Agility compliments the style of the master magician, but what is a little surprising is the implementation of a collar design. Along with the fresh upper material and its honeycomb style construction, there is a lot to test out performance wise. The design is striking and really stands out in particular as part of the recently released Mercury Pack. 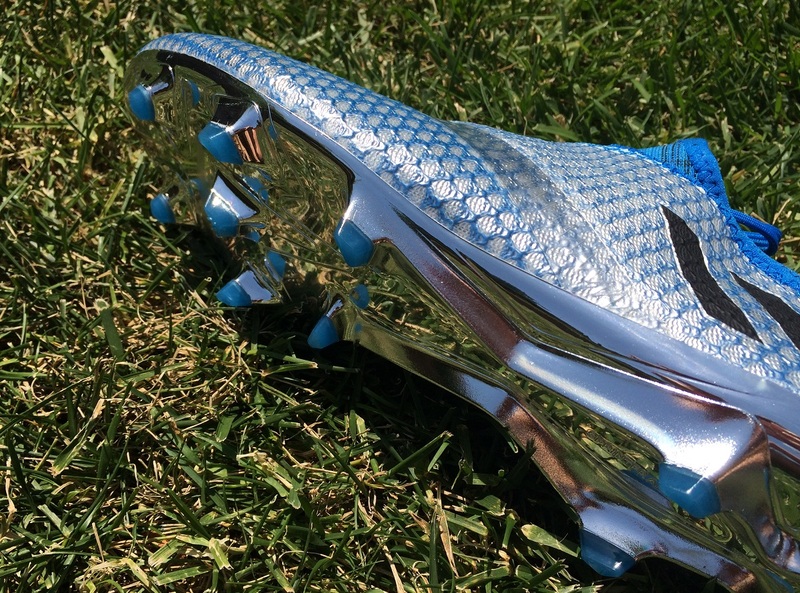 One of the most important aspects to note about this release is that it is built-in the same mold as previous Messi boots. What this means is that the shape of the boot is slightly narrow through the forefoot and it heads to a sharper point than many other boots. So, it is not a boot that will suit all players. As a medium/wide fit, I had reservations when I slipped them on for the first time. When you factor in the closed tongue design and TechFit collar, they are a tight boot to slip your feet into. Very tight! I had a moment where I questioned whether I should be testing them because they were so snug. But, having persevered through a few break-in sessions, they loosened up a whole lot, like a surprising amount. The upper is called AgilityKnit, a knitted synthetic, which has a “honeycomb-esque” design pattern to it. Through wear, it adjusts to form a perfect shape around your feet. In total, it took 3 or 4 warm up sessions wearing them before I was ready to take them into a game. So, I would be mindful that they take a little extra time to break in. The first time I wore them, they were extremely tight and definitely caused some cramp. For narrow fitting players, I don’t see this being an issue. But if you end up wearing them and you have the same experience through first wear, bear with them. Over time they really get better to the extent that I’m 100% confident wearing them through a 90 minute game right now. Outside of that, they are a very comfortable boot. The materials used are soft, with ideal padding around the ankle to keep you locked in comfortably, without any noticeable hot-spots. There are 3 layers on this boot to break down. First, there is a padded underlay material that provides comfort and a soft feel across the forefoot and toes. On top of that is the knitted material, which has definition and creates the honeycomb style design that you see across the upper. Its role is very important as it defines your touch and contact with the boot. On top of that is the final layer, a thin synthetic that is stretched across the front of the boot to enhance durability and ensure the structure of the boot is not compromised over time. There is some stretch in the material and they loosen up slightly after a few wears, but that synthetic layer ensures it doesn’t over stretch. 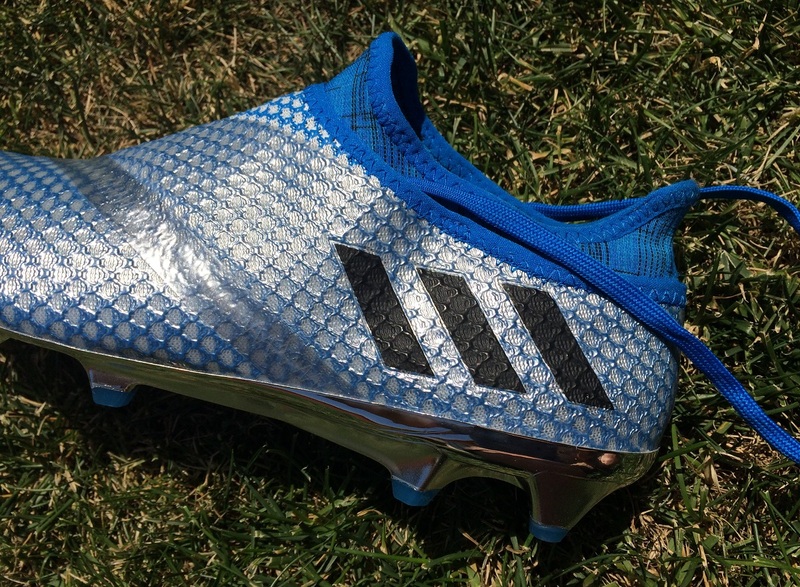 Then there is that unusual V style tape that runs across the midfoot potion of the boot. 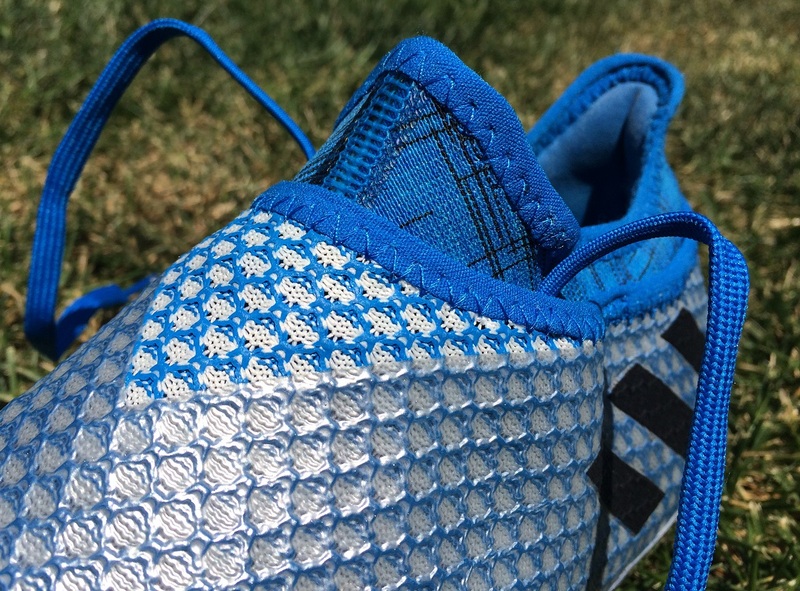 Basically, adidas has pieced together two layers of material in the construction of the boot. What this does is allow them to define angles in different areas. The top section is intended to run gently down the front of your foot in the same fashion a boot with laces would when you tighten them up. This creates the first layer of lock-down between boot and foot. The bottom portion is the angled in a softer fashion, flush with the angle of your foot to ensure you still have some room to maneuver during play in a stealthy fashion. The tape covers the stitching between both sections, ensuring it stays hidden from wear and is well protected. That takes us to performance and how they feel when striking the ball. As an agility focused boot, you might think they are more adept for general touch and control on the ball, when you need to cut from tight angles. Well, they basically are! The gently raised honeycomb panels create the perfect surface for cushioning the ball in tight spots and when taking in passes. I actually found the material to be softer than the PURECHAOS, which makes them more useful as it provides a more natural feel on the ball. In saying that, they are equally functional when it comes to striking shots and playing long passes. I found that the material provided enough shock absorbing cushion to allow you to really put your foot through the ball without feeling the full impact. They are a very competent boot in that respect. Think of Messi for a second and what he would have requested in a boot from adidas; as a creator he needs something that allows for dynamic touches in tight spaces, something that would provide equally uniform feel as he dribbles at speed taking on players, and a boot that cushions impact while striking shots. It is a very difficult list to fulfill, and I don’t think there is a way to cover every point equally well. 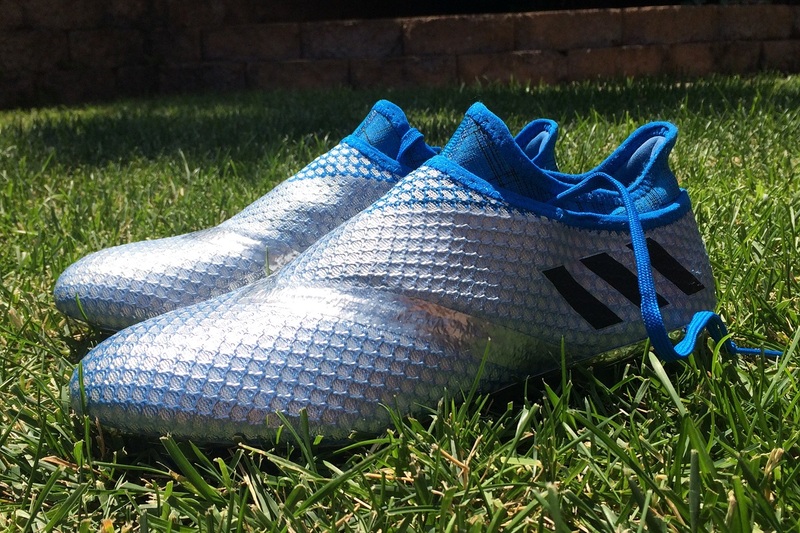 But, adidas has put together a high quality boot that gets very close to meeting all the needs. 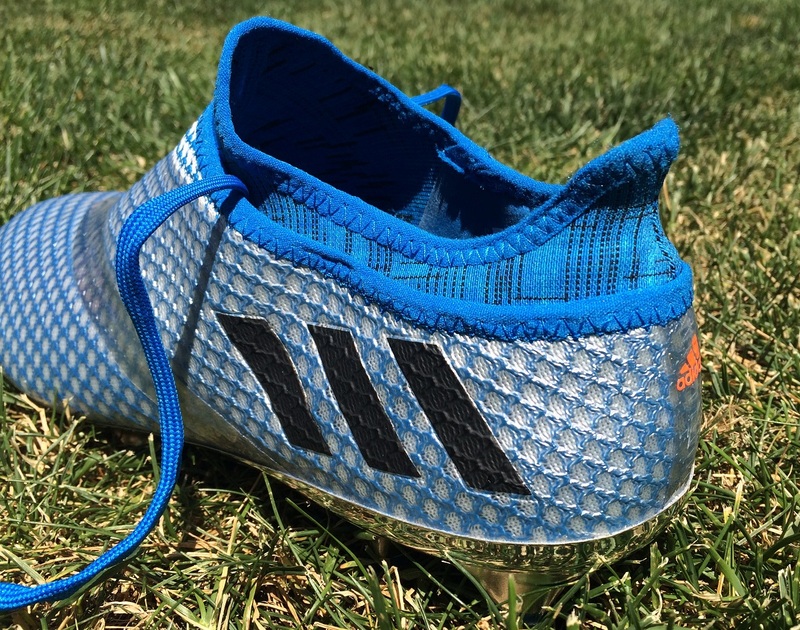 Underfoot, adidas has gone with a SprintFrame soleplate, which replaces the Gambetrax system from the Messi 15.1. This brings the Messi in line with both the X and the Ace silos. The actual plate stays the same, but a new stud configuration is added here to enhance agility though play, as you look to chop and turn out of tight angles. 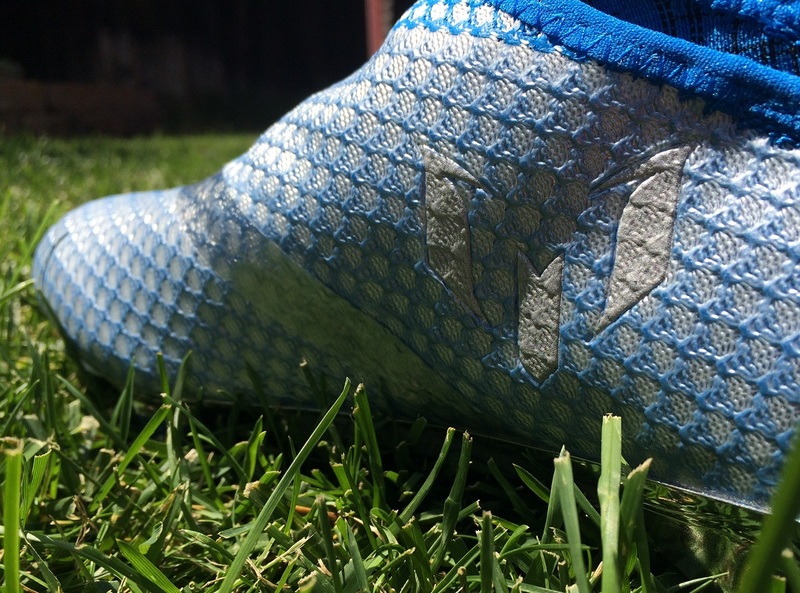 The studs take on a matrix style triangle shape, 7 toward the front of the boot and 4 in the back. Elevated ridges between the studs work to decrease any stud pressure and allow for quick release from the surface through play. First thing to note, I never encountered any stud pressure through play – a definite positive. And the studs really do penetrate well on natural grass surfaces, where they are intended for play. What is interesting here is the fact adidas went from advertising their boots as FG/AG compatible, to simply sticking with the FG naming. That doesn’t mean you can’t wear them on AG – let’s be honest here, the majority of us are switching between both surfaces from week to week – but it does raise the question of why they made the change. On AG, I found them to be sufficient with no noticeable problems on updated turf. But I did wear them on an older version and there was noticeable drag, something to note if you play on an older AG surface. 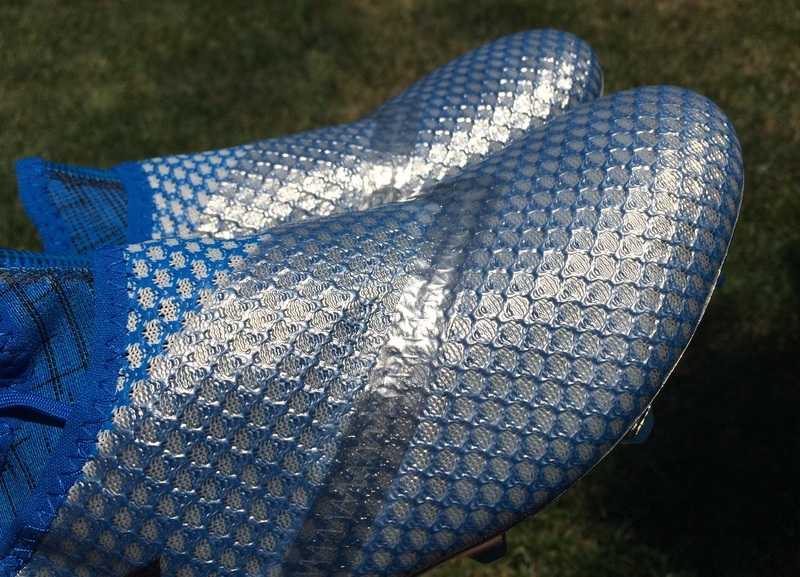 The soleplate does come with a warning stating the chrome coating will chip over time, and it does. Underneath that chrome, there is a slightly off grey finish that creates a slightly different look. As you might have gathered from the review to date, this is a boot that fits tight through the fist few wears but does offer some stretch over time. The general shape of the forefoot follows previous Messi styles as the angles meet up at a tighter point than other adidas releases. This produces a slightly more accommodating fit length wise, and becomes a more naturally functional boot for players with a medium or narrow fit. And when you factor in the snug structure of the materials used, this is not a boot I’d recommend for players in need of a wide fitting boot. In my instance as a medium/wide fit, they worked out nicely. 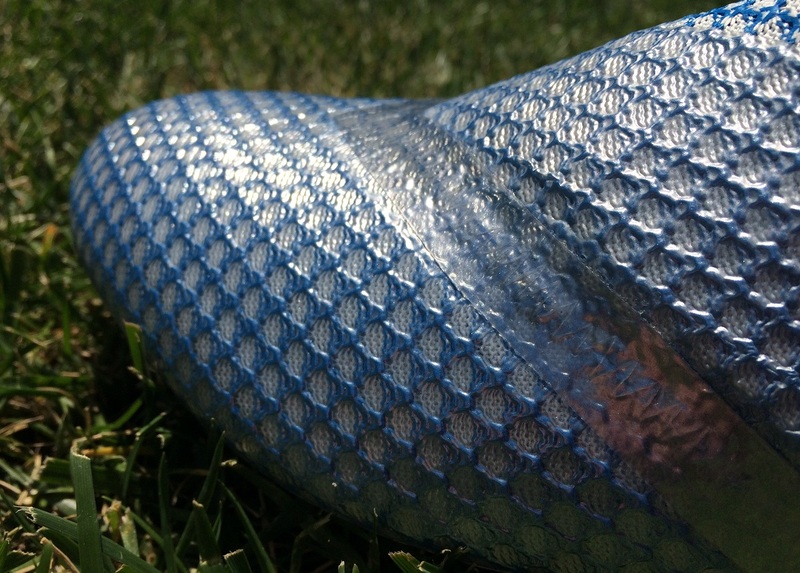 This is a tight-fitting boot starting out, and it might be an aspect that scares some players off through wear. They do stretch slightly, however, so if you own a pair and have concern, give them time. One thing I’d LOVE to see on these boots is a pull tab to help get them on and off. Nike has one on their dynamic mid-cut collar boots and they make life so so much easier. Even after several months wearing them, I still face the challenge of pulling them on/off. Since this review, new colorways have been released in the series. See the entire Messi16+ PUREAGILITY line-up currently available at soccer.com. Highlight: An upgraded Messi release that is intended to serve the Maestro’s game to perfection. A snug fitting boot that provides a tidy feel and touch on the ball while also serving to reduce impact as you strike shots. Category: Created as an “Agility” boot. Would I Buy Them: This is a boot that gets better with time, so if I had time to spend with a boot, I’d buy them. But, if you are looking for something to wear out of the box, maybe not. Player Position: Think Messi and that is who they are intended for! But they also have a wider appeal thanks to the durable nature of the upper and its dynamic feel on the ball. If one had to choose between messi 16+ and ace 16+, which one would you recommend ! is it good for shooting? will it be as thin and feel the impact as much as a vapor?